A very British horror anthology, cleverly adapted from the West End show for the big screen. 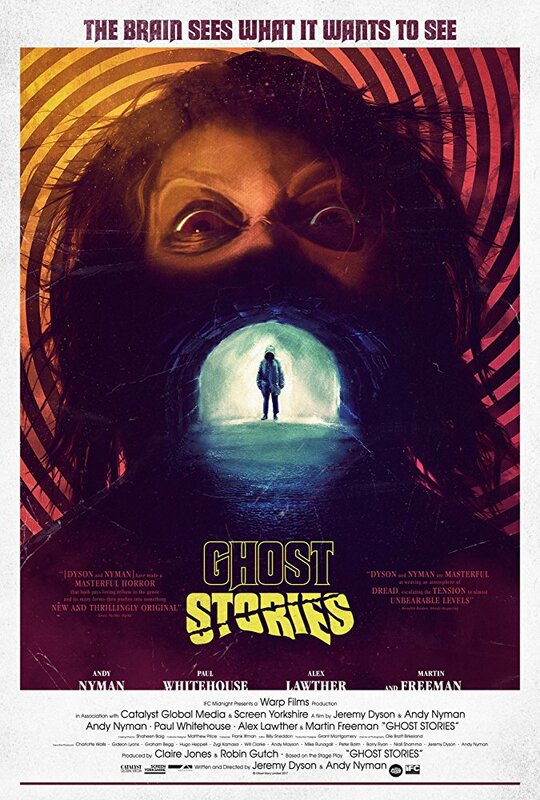 It pivots around a familiar sceptic character – Andy Nyman’s paranormal-debunking Professor, first seen exposing a conman psychic – but has fun playfully subverting our expectations of the format while finding fresh directions for the old ghost story trope of the “unreliable narrator”. A staunch believer of the concept that “the eyes see what the brain tells them to see”, Nyman is requested to interview three men who will allegedly alter his mindset on the supernatural. This is the framework for a trio of tonally and visually distinctive ghost stories, with Paul Whitehouse is superbly cast against type in the first, as a night watchman with a tragic personal history who’s terrorised by something unearthly during one long night on the job. His funny, almost painfully moving portrayal of a casually racist, Brexit-era Brit is the core of a brilliantly sustained descent into literal darkness, with great use of in-camera frights and lighting. The second story channels THE EVIL DEAD as it follows a student (Alex Lawther) menaced by something demonic in the woods, balancing out the chills with clever comic asides, including a marvellous cutaway to a Sooty Show poster. And the third pulls off another casting coup by finding genuinely obnoxious and creepy dimensions to Martin Freeman, here essaying a wealthy businessman on the Yorkshire Moors in a story that sustains dread from the expansive locations and the open plan luxury of his massive house. GHOST STORIES is properly scary in ways that the typical (and overpopulated) Hollywood ghost story rarely is: avoiding an excess of noisy jump scares and sustaining an ambience of unease, it has us looking in the corner of the widescreen frame for things that, often, are simply not there. It also offers a disorientating final act that subverts everything we have just seen, rewarding attentive viewers and unfurling a tale of a haunted mind rather than a physical haunting. Making smart use of recognisably drab British locations and boasting a fine sense of (nervous) humour, the movie haunts in lots of different ways and, typical of its unpredictable nature, caps a bleak conclusion with the chirpy sound of Boris Pickett and the Crypt Kickers singing “The Monster Mash”. I have checked and it was, yes, "The Hobbit," and not "The Lord Of the Rings." "The Hobbit."